City Manager Rashad Young reduced the ban on five Spirit of the Sit-in Movement Initiative members today from two years down to one. 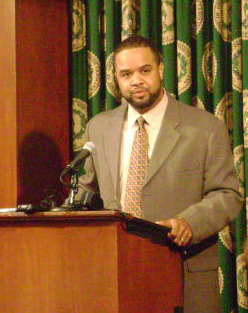 After taking over City Council’s seats on May 4, 2010 to draw attention to the City’s inaction around misconduct in the police department, the City Manager’s office banned the five members who were arrested as an act of civil disobedience. Five other members of the organization took over the seats as well but were not arrested and not banned. The ban has already been reduced to only being banned from the Melvin Municipal Office Building on days when City Council is meeting (twice a month), down from a flat ban in general. Last week, Young met with three members of the SSMI, including two who had been banned, as they appealed to him to lift the two year ban. As of today, the ban will end one year from the act of civil disobedience (May 4, 2011). The Spirit of the Sit-in Movement Initiative is hosting a screening of Greensboro: Closer to the Truth. This documentary uncovers the history of the Greensboro Massacre in 1979. Invite your friends and come on time, because you won’t want to miss anything! Last night’s movie screening of “Black and Gold: The Story of the Almighty Latin King & Queen Nation” was a great success. Technical difficulties causing us to start late, but we had a brief introduction and question & answer session with King Jay and King Hype of the ALKQN in North Carolina and Eric Ginsburg from the Spirit of the Sit-in Movement Initiative. Over sixty people were in attendance at New Creation’s congregation room at First Presbyterian Church on Elm St. Many thanks to Reverend Frank Dew for hosting the event and to the many people from his church that attended the event. The Spirit of the Sit-in Movement Initiative will be hosting another movie screening on August 26. “Greensboro: Closer to the Truth,” a documentary on the Greensboro Massacre of 1979 will be shown at 8pm at the Greensboro HIVE (1214 Grove St in Glenwood). These events were organized as part of the Greensboro Justice Summer campaign to address corruption and misconduct in the Greensboro Police Department while standing for justice and dignity for all. Below is the statement that the five Spirit of the Sit-in Movement Initiative members made in court. It was read by Wesley Morris. On May 4th, 2010, 10 young people who are students, community members and friends committed an act of non-violent civil disobedience by occupying the chairs of city council members during a recess of a city council meeting. Five of us including myself were arrested on the charge of second degree trespassing upon not leaving the Melvin municipal building upon request. This act was not committed as an attempt to gain notoriety, political standing or to disrespect any individuals or personalities. It came from a firm belief that the larger Greensboro community, as diverse as any, required a sacrifice to urge its cities leaders and to inform its public and to participate more fully in its cities decision making process and oversight as it relates to the police department and city government. It also came with knowledge of the tradition of non-violent actions to petition for rights. As we stand here right now, painfully, a new jail is being built and is to be filled with people, young, old and from all backgrounds for economic gain, although the city states that the crime rate is down nearly 25 percent. We reiterate that we are thankful for good police work and quality re-direction programs for young people but, as we stand here many say there is no need for a new mechanism to oversee police work, yet, people we know and have met, are being run down and harassed and having their rights and humanity disaffirmed all throughout the communities we work in by this police department. And within the department the mistreatment of officers like AJ Blake and Captain Cherry who spoke out against corruption is troubling. cases such as AJ Blake and Captain Cherry are troubling. Each of us work in community building efforts, whether through youth programs, social change organizations or community service and will continue to do so. We thank the court for the opportunity to thank those who helped see us through a 6pm-6am curfew that was eventually lifted and understanding and processing the city manager’s decision to ban us from the city council chambers for two years as well as the feeling of being misunderstood by many within the city. We count these as minor burdens in light of what many others in our communities endure. We thank the many pastors and minister’s of the city who in their own standing put at risk their names by reaching out to us and educating us on how to move forward. As young people who have yet to see all of what is ahead in life, we stand in fullness of spirit believing that what judgments come we hope that the health of the city and its institutions progress towards more equality and justice for all people, as we as individuals aim to become better brothers, sisters and servants to the greater good to each other and our city. We have brought our not so perfect selves to the court and hope that you will see that we have learned and gained many lessons from the demonstrations of May 4th and look forward to committing our time and efforts towards building this city by working with its leaders and its citizens. Now unto the power and source that can keep us from falling and present us faultless and blameless before God and man, we thank you.